At our annual club winter meeting on Saturday evening, Coach Jerry proudly recognized our top performers and notable contributors during 2018. Paul showed great range in 2018, running extremely well at distances from the mile to 10 miles. On the shorter end, Paul anchored our victorious DMR at the Millrose Games by patiently closing a large deficit and taking the lead in the last 10 meters for the win. 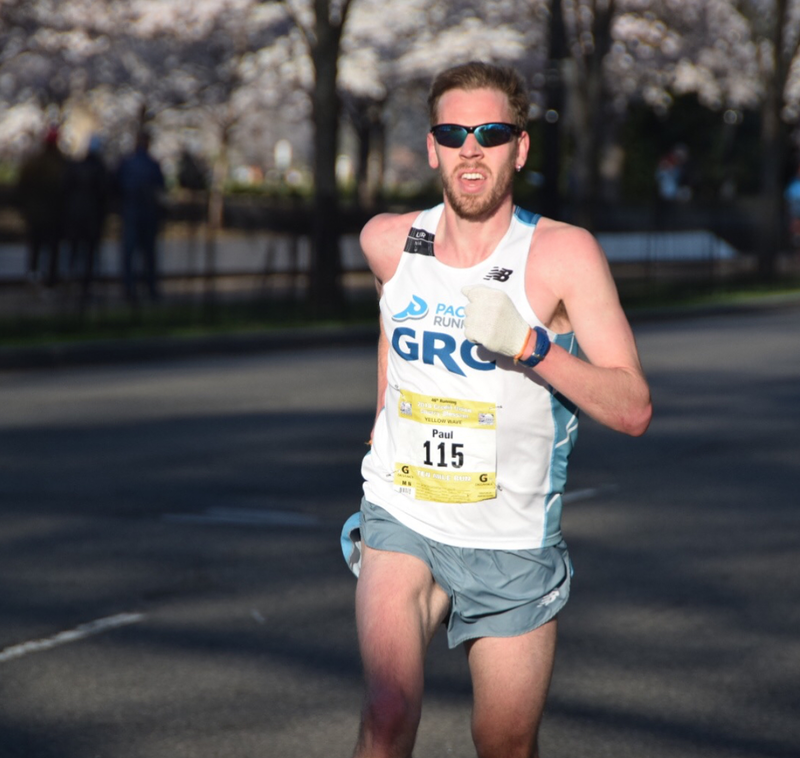 On the longer end, Paul ran 50:32 at Cherry Blossom, and was the top local finisher. Outdoors, Paul set a GRC club record in the steeplechase, running an excellent 9:00.52, and also ran 14:29.05 for 5000, which is fourth on the GRC all-time list. 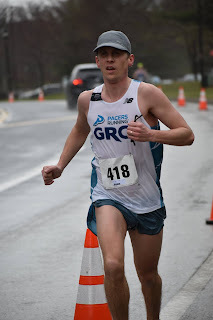 On the roads, Paul got wins at Clarendon Day 5k, 4 Courts 4 Mile, and Navy 5 Mile. In addition to his outstanding performances, Paul is a vocal leader who brings an intensity and focus to his training and racing that is exemplary. Maura had a great year on the track and the roads. Maura won the 5000 at the Bucknell Bison Invitational against a very strong field, running a huge PR of 16:27.3, which is third on the GRC all-time list, and surprised herself by closing in 33 seconds for the last 200 for the win. Maura also won the 5000 at the Maryland Invitational and Swarthmore Final Qualifier, and was third in an elite field at Music City Distance Carnival. 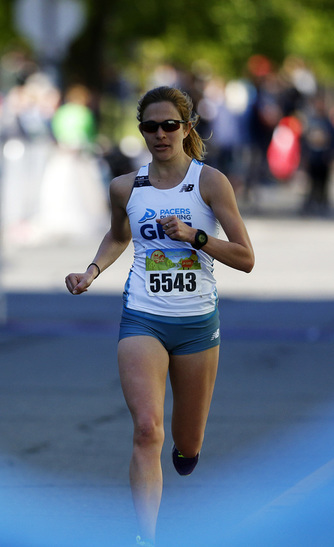 In addition, Maura was third in the Olympic Development 10,000 at Penn Relays in 34:44. 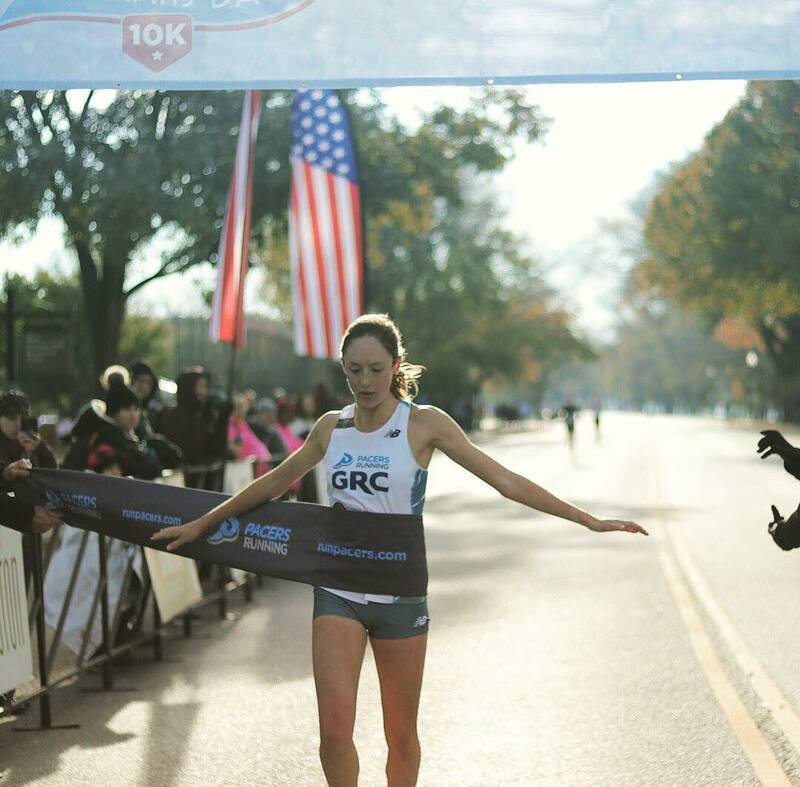 On the roads, Maura won the Veterans Day 10k in 34:47, and was second in the Alexandria Turkey Trot 5 Mile in 27:59. Maura has much more in the tank, and we're going to see many excellent performances from her in the months ahead. Sam's outstanding 2:19:57 at the California International Marathon, a seven minute PR which puts him third on the GRC all-time list, and which was 47th on the Track and Field News 2018 US List, was the product of months of hard training. Sam is a true marathoner--he puts in very high mileage, and what he lacks in speed he more than makes up for in strength. Sam is only starting to tap into his potential, and he is a legitimate contender to qualify for the 2020 Olympic Trials. challenging course. Molly is back to full health, and we will see great things from her in the future. 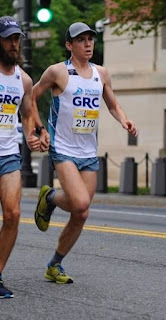 Luke came to GRC with truly stellar credentials--he was a two-time All-American at Yale, and a two-time Olympic Trials qualifier, having run the steeplechase in 2008, and the marathon in 2012. In his long GRC career, Luke has had many excellent performances including a club record 48:45 for 10 miles, 1:05:33 half marathon which is 4th on the GRC all-time list, and numerous top 100 finishes at Clubs XC, including 72nd place in Bend, OR, which is the 10th best finish in GRC history. But the performance that best exemplifies Luke's contribution to GRC was the 10,000 at Penn Relays in 2014, where Luke sacrificed his own race to rabbit a young teammate, who with Luke's help won the race. While Luke's performance that night--29:45, which is 5th on the GRC all-time list--was pedestrian by his extremely high standards, it set the tone for his years of leadership for our young athletes, many of whom have benefited from his willingness to share his vast knowledge of training and racing. Kerry richly deserves this award for both her excellence as an athlete, and her long service on the GRC board. Kerry had an incredible breakthrough in 2018 when she qualified for the Olympic Trials Marathon by running 2:41:33 at Twin Cities, which was a PR by more than 10 minutes. That performance was 47th on the Track and Field News 2018 US List, and puts her second on the GRC all-time list. Kerry's amazing performance was years in the making, and was the product of dogged persistence in the face of a series of obstacles, including numerous injuries which had prevented her from reaching her potential. Kerry refused to give up on herself, and all of her hard work and dedication produced her incredible run at Twin Cities. Kerry has more room to improve, and she will be ready to prove it at the Olympic Trials. Kerry has also provided years of dedicated service to GRC as a member of the board, and served as president for the last two years. Kerry's service on the board has been integral to the team's continued growth and success, and we all owe her a huge debt of thanks.